I don't know if this helps or not but here's some additional info. I have replaced part of our web address as well as the RMM+ key. cmd.exe!!! /c "powershell -command "& "Invoke-RestMethod -Method Post -Uri 'http://mycompany.hostedrmm.com:8040/App_Extensions/8e78224d-79db-4dbb-b62a-833276b46c6e/Service.ashx/ExecuteCommand' -Body'[\"XXXXXXXXXXXXXXXXXXXXXXXXXXXXXX\",\"e0749814-5306-4dce-ae88-e1f70e97984f\",\"ipconfig\",\"10\"]' -ContentType 'application/json'";"
You don't need the plugin to be able to pass commands to screenconnect. You can call the webservice and do everything via powershell. The examples work very well. After my last post I saw your most recent posting on the second page. 1) A script which executes ipconfig on a machine. each of the script is prefixed by "ixp-", so you should be able to find them if they are imported somewhere strange. 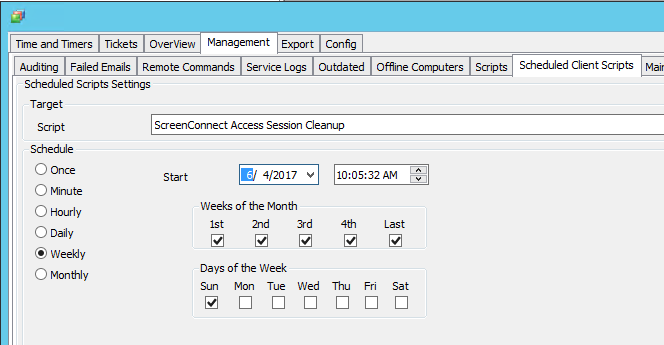 Are you aware that you posted the password to your screenconnect server? I haven't tried it, but if its valid, you've given open access to the world to every machine with SC installed. First off, thanks for pointing out the accesskey in my post. I caught it in the output but not from the parameters. I've changed it here and will change it in the extension and script. Second, thanks for the info. I'll take a look at your scripts and see what I can do. Can your plugin support terminal commands down to a MAC or linux box running ScreenConnect? From what it looks like is your plugin is set to run commands using cmd.exe on Windows. Can we add a OS vendor type that will change behavior so it executes commands on MAC ? I am using the unbuild method in SC that sends commands to the agent. This should work for Windows,MAC and Linux. We just updated the plugin at https://delivery.shopifyapps.com/-/ca96d40efa30a1ce/b30d4e80c1cd1d7b, we now test for Mac and Linux OS types and handle ScreenConnect commands for each OS type. Give it a spin and let us know how it performs. Updated plugin to 1.0.4 with new function HostsConnected. See original post for usage. How would you use this (purpose)? I understand the isOnLine function which I am now using in the next version of plugin but what would I use this for in relation to the computerID i am getting the SCGUID for? Sky is the limit. It was added for a particular use case where someone wanted to create a script to cleanup leftover printers that SC sometimes leaves behind. They wanted to run this script on all systems except for those with hosts connected to them. I could think of many reasons like creating a script in LT to find out who is connected to what....reports...who knows. The IsOnline tells us if the guest is online or not. The HostsConnected tells us if the host side is connected or not. Ah.. I do know I could use a list of screen connect agents offline currently that I could match to computerID's inside of LabTech. This would allow me to make a list that would work in the opposite way and restart SC agents from LabTech if they went south. Not that I suspect that is as much of an issue..
RMM Plus is really awesome. Below is the "offline server" monitor I created yesterday and decided to share. It is a rawsql monitor and all the variables are at the top for an easy adjustment. The monitor will attempt to restart the agent before it alerts. I run the monitor every 2 minutes. There is a note above each variable. If you read the notes, everything will make sense. Would it be beneficial to have a function for instance OfflineAgents and OnlineAgents that would return an array of GUIDs? Done, When 1.0.5 hits it will have the new functions. See OP for the functions. This is another rawsql monitor that finds agent that are unable to finish executing command. The monitor doesn't need an alert template, because the reset command is pushed through the INSERT to the commands table. Added new EndSession function. Keep a look out for version 1.0.7 showing up as an available update in the coming days. I created a cleanup script that removes dead entries from both databases. When setting it up, set both the ID for the labtech server and the access key for RMM+ in the global variables. 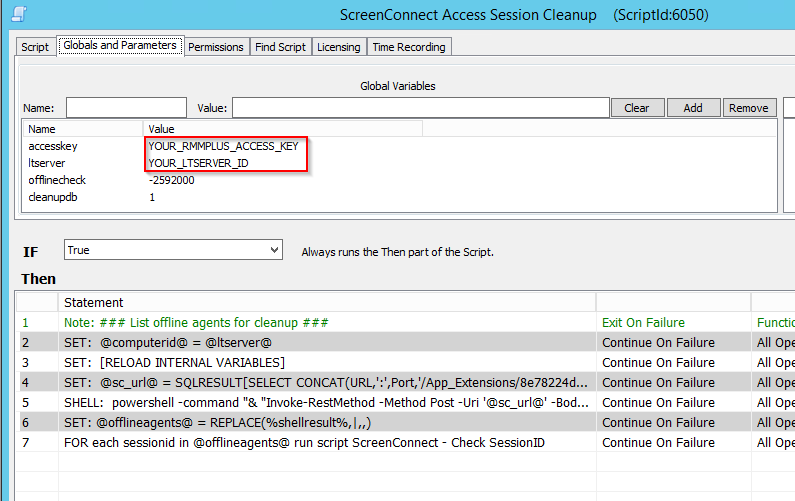 The script defaults to cleaning up agents that haven't checked in for the past month ( -2592000 seconds ) and will also remove entries from the plugin_screenconnect tables for the SessionID that is being removed. In order to use this, go to the dashboard and set a scheduled client script ( I set mine up to be weekly, but choose whatever interval you prefer ). How would I run a powershell command against on offline agent if we have a cloud hosted LT server? I can't run the LTServer Shell Execute command. We don't have admin permissions to run powershell on the cloud hosted server. install the HTTP GET/POST plugin attached to the OP.